This was the frankenstein compromise resulting from weeks of earlier vacillation by the various networks on what kind of debates can be had when the result looks headed for a messy (or welcome, depending on your point of view) coalition. Who won? That’s a stupid question, obviously. Noone can ‘win’ a 7-way tug of war. Or can they? For many, the girls won it. Ok, before you shoot me for using the word ‘girls’, I mean it in the most appreciative way possible. It just happens that the three women on stage come from small parties, none of which could be said to suffer (at least not yet) from ‘big party syndrome’, meaning that you can potentially trust what they say to be what they mean, and to reflect actual policy that would be implemented, were they to win power. Nicola Sturgeon did particularly well, but the other two were fine and clearly spoke from the heart. Farage was the only bloke on stage saying what he really thought. Which was good, because the funny things he said should make it easy for voters to forget UKIP. Memo to all political parties: we’re in a post-marketing age. Most people, and all young people know marketing when they see it, and know it is unrelated to the truth. So this election is easier than you might think really. Almost the only thing that matters is words you might trust, versus words that are just noise. It doesn’t matter if Labour ‘have a plan’, even if it’s a slightly good one (it isn’t), or the Lib-dems know the ‘right balance’, because both will do what is needed to ensure the preservation of party and image. As will the Tories for whom self-preservation is simply an article of faith. So I suggest when listening to anyone from those parties on TV, just turn the sound down, perhaps put some nice music on – anything from Mozart to Motorhead will do (if the former, Requiem would seem appropriate; in the latter case, I suggest ‘Eat the Rich’). This will save you time and enable you to concentrate on issues that really matter, like austerity, education, the NHS and a sustainable society. I’m not saying the SNP, Plaid Cymru or the Greens have everything right, but they’re clearly a) not robots and b) interested in a better deal for everyone, not just themselves. From the mainstream politicians, all you will hear are the recitations of their respective tribal creeds. Particularly annoying when it’s Michael Gove, on Question Time last week, quite unable to say one intelligent thing when it came to the question of possible coalition formation post-election. Well, he is an ideologist, and has ruined education in this country, so no departure from the expected here I suppose. So if you feel a bout of confusion or doubt coming on, refer to the handy election guide above, and that should sort you out. 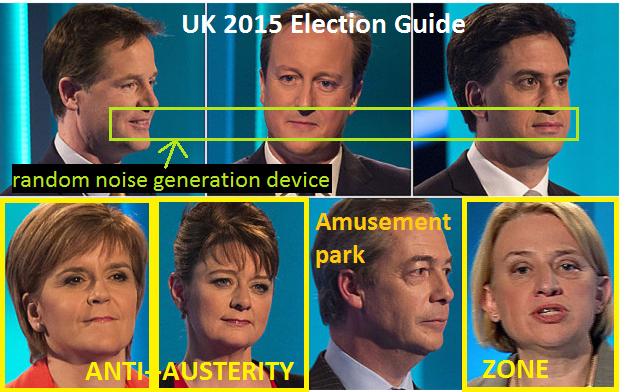 This entry was posted in Culture, Politics and tagged austerity, greens, snp, uk election 2015 by wolandscat. Bookmark the permalink. Like your blog, nice to see a young person engaging with politics. Make some noise and get your friends interested enough to vote, no matter what party it may be for!